Keepit is online backup done right – simple, safe and automatic. It has never been easier to secure your precious digital belongings. 1. After installing the Keepit software they’ll take care of the rest. Keepit will automatically do a backup every day without requiring you to do anything. Your PCs default folders are automatically backed up – and you can easily add and remove folders to be included in your backup. 2. Keepit automatically does backup every day. No need to launch an application, remember to insert blank cd-roms or connect an external harddrive. Nothing. When the machine is on it performs backup every day. Off for a couple of days? No prob – Keepit detects it and does a fresh backup as soon as possible. 3. Your files are encrypted before they ever leave your PC. The transfer to Keepit is done over a secure connection before the encrypted files are stored at the Keepit serverfacilities. That’s double up on security – just like your Internet bank. When you create an account you get a private key ensuring that you are the only one who can access and read your private files. 4. 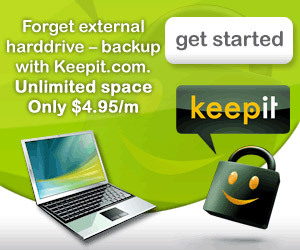 With Keepit UNLIMITED you get the space you need for your backup. No need to know if you require the 2, 3, 7, 12 or 17 GB package. No need for a calculator or magic ball to guesstimate how many photos you might be taking the comming year. Just press start and they’ll backup what you got. 5. Feel safe that your backup is safe at a place which is safe. Your backup is stored in a professional and monitored storage environment with redundant power and connection. Their facilities are located at two separate locations, both near the main Internet infrastructure ensuring optimal data transfer speed. 6. Keepit is the low cost solution to your backup needs. Try comparing time it will take before you have spend the same amount of money on keepit.com, as you would for an external hard drive, or the pile of cd-roms you would need to keep creating current backups of your files yourself.